Before you put any marshmallows on a stick, read this to determine if a DIY hearth is a project you’re prepared to take on. 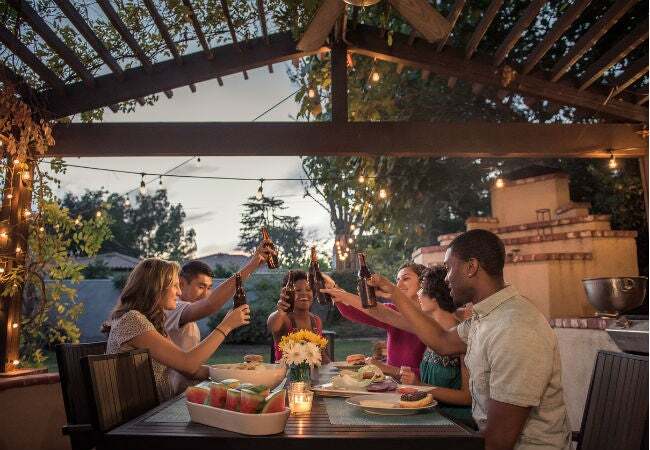 It’s the ultimate in backyard entertaining—an outdoor fireplace where friends and family gather to share good times and delicious food cooked over an open flame! The ambiance and dramatic appeal of such a device put it at the top of many a homeowner’s wish list, but do-it-yourselfers should know what they’re getting into before attempting this heavy construction project. Ahead, we’ll help you navigate preliminary issues, explore the various styles and materials available, and offer some tips on building your own outdoor fireplace. Rules will surely apply to ensure the safety and structural integrity of your outdoor fireplace. Some communities require special licenses and permits while others may specify the type of fuel you can use (wood or gas). Nearly all communities have ordinances about how far the fireplace must be away from structures, trees, and fences (often a minimum of 10 feet). Chimney height may also be regulated. Most rules that relate to outdoor fireplaces are for safety reasons but others ensure the structural integrity of the fireplace. Place a call to your insurance agent to see if your existing homeowners’ policy will cover any damages caused by an outdoor fireplace. Make another call to DigSafe (811), which will prompt your local utility companies to check the locations of their buried lines so you don’t accidentally disturb them during construction. Once the red tape is out of the way, you can start planning for your fireplace. Fireplace design should reflect your reasons for wanting this backyard addition. Will you use it to prepare food or entertain large groups? Perhaps you prefer a cozy, romantic spot to snuggle. Also think about how your fireplace will enhance your landscape and the architectural style of your home. A classic red brick fireplace will look great paired with a Greek revival or colonial style home, while an adobe one will be more in keeping with a southwestern style or ranch home. While you’re in no way limited to a specific style, you should make sure your fireplace complements, rather than detracts from, your overall home theme. Imagine how your fireplace will look from different vantage points. A large fireplace is a major investment and you’ll probably want to be able to see it from inside your house. Give yourself enough room to fully enjoy the fireplace. The general rule is to allow a minimum of five feet in front of your fireplace for the sitting area. This allows for a space of two feet between the fireplace and the fronts of chairs or benches. Any closer and guests may get too warm, but any farther away may leave them chilly. All fireplaces must be constructed of heat-safe materials, which usually mean brick, block, concrete, or stone for the exterior. Depending on the design, the interior frame of the fireplace may include cinder blocks for support. The firebox (where the flames actually burn) must be constructed from steel or fire-rated bricks that will withstand extreme heat. A traditional fireplace with a chimney will require a fire-rated flue pipe that leads from the top of the firebox to the top of the chimney. 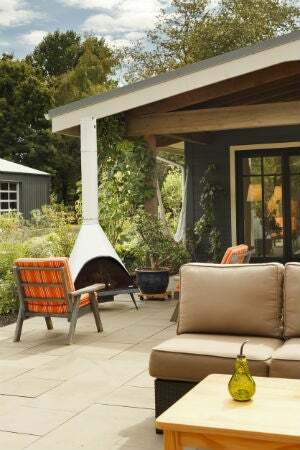 Backyard fireplaces run the gamut in cost, with portable chimineas starting around $100 and decorative gas fireplaces running between $300 to $700. The nice thing about a portable model, obviously, is being able to position it in different areas of your yard and patio. Open-pit fireplaces may also be portable, but more often they’re constructed in place and designed to be a permanent fixture. If you do the work yourself, you could spend as little as $150 to $200 for stackable cinder-bricks, a fireproof pit bowl, a grate, and a domed cover. If you prefer the look of real stone, you can purchase a fireplace kit with all the materials you’ll need for around $750. While designing and building your own large stone or brick fireplace will certainly cost less than hiring a contractor, for the best results, you should have basic construction and masonry knowledge. As a rough example, a standard, 5-foot by 4-foot brick fireplace with a 12-foot chimney will set you back approximately $1,500 dollars in materials. That includes standard house bricks, fire-rated bricks for the firebox, a clay flue, mortar and refractory mortar (required for the fire box), and an iron grate. A fireplace of this size requires a structural base (see DIY Directives, below), which could add another $200 to $400. Material costs will vary based on the price of the bricks or stones used to construct the fireplace. A professional mason may charge anywhere from $5,000 to $12,000, or more, for a similar brick or stone fireplace depending on size, material choice, and design details. If you want a large fireplace and you’re not DIY-inclined, this is a project best left to the pros. High-end fireplace kits from manufacturers like Unilock are designed to be installed by contractors or construction-savvy DIYers. Unilock’s Tuscan pre-built fireplace runs $7,700 for materials; if hiring a contractor to install it, expect to pay another $1,500 to $3,000, depending on labor costs in your area. • Brick and stone construction is extremely heavy and requires a solid base to keep the fireplace from settling. For a permanent stone fire-pit, excavating to a depth of nine inches, then filling the hole with 6 inches of pea gravel and topping it with a 3-inch concrete pad is probably sufficient. • A larger fireplace may require a structural footing, which involves pouring a concrete footing below frost level (the depth to which it freezes in your area). 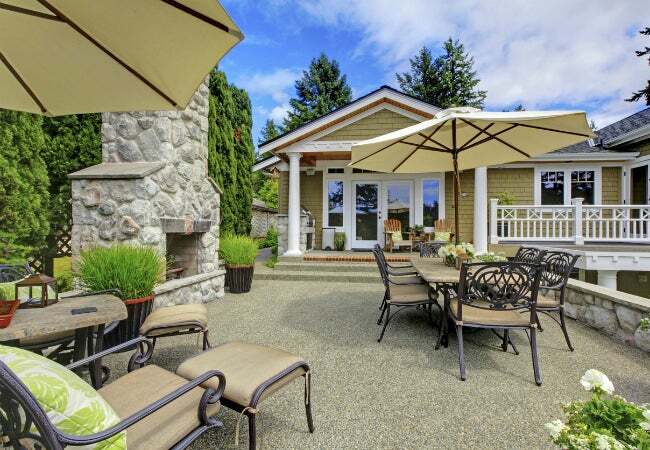 Depending on the size of your fireplace, an existing patio may not be sufficient to support the weight. Check with your local building inspector if you’re unsure. • Constructing a fireplace from a pre-built kit that comes with step-by- step instructions simplifies installation. All the necessary materials are included and the manufacturer will specify the type of foundation required to support the fireplace.